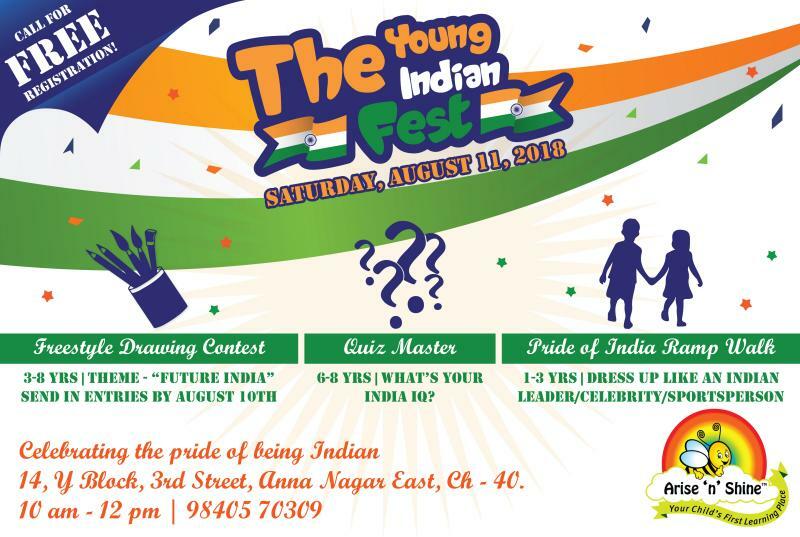 Arise ‘n’ Shine International proudly presents the biggest celebration this Independence Day- The Young Indian Fest! Here is a chance for the young Indians showcase their patriotism. Join us to explore, express, and experience your love for the nation! The Young Indian Fest is on Saturday, August 11th, 2018 at 10am. In celebration of India’s Independence Day, we have THREE CONTESTS for Children along with lots of fun, laughter, and excitement. This event is for children between for 1 – 8 years of age. CALL 9840570309 for FREE REGISTRATION! Winners will receive prizes and participation certificates for all. Children can dress up like any famous Indian personality/celebrity/leader/etc and imitate them as they walk the ramp. Children will be given a performance time of 2 minutes. Two guests can accompany each child. Here is a chance for children to discover how well they know India. Participants will be taken through different round of questions on India.